Liev Schreiber gives an extraordinary and committed performance as Chuck Wepner, the man who went fifteen rounds in the ring with Muhammad Ali and became the real-life inspiration for Rocky Balboa. But before all that, Chuck was a liquor salesman and father with a modest prizefighting career whose life changed overnight when, in 1975, he was chosen to take on The Greatest in a highly publicized title match. It's the beginning of a wild ride through the exhilarating highs and humbling lows of sudden fame—but what happens when your fifteen minutes in the spotlight are up? Biopics are a dime a dozen. Every year, another star steps into the shoes of another famous social figure and take a shot for Oscar gold with a tour de force performance. With Chuck, we get to watch Liev Schreiber deliver one of his best performances as Chuck "Bayonne Bleeder" Wepner - the man who famously went toe-to-toe with Muhammad Ali for 15 rounds and proved to be the inspiration for Rocky. Even with a terrific cast including Elisabeth Moss, Ron Pearlman, Naomi Watts, and Michael Rapaport, the film can't escape the tried-and-true predictability of the Biopic formula of the rise, fall, and eventual redemption of its lead character. Chuck "Bayonne Bleeder" Wepner (Liev Schreiber) is the best Heavyweight fighter in Jersey. Ranked 8th in the world, should the stars align in the right order, his trainer and cut man Al "The Butcher" Braverman (Ron Perlman) thinks he has an honest chance at taking on George Forman for a shot at the title. Only the stars don't quite align. Muhammad Ali manages to knock out "Big George" leaving an open hole in the rotation that only Chuck can fill. 15 rounds later Chuck has lost the fight but won the respect and adoration of the people. And with that fame, Chuck's worst tendencies come rushing to the front. Nights of boozing and womanizing estranges him from his wife Phyliss (Elisabeth Moss), his young daughter, and his brother Don (Michael Rapaport). When a movie loosely based on his life called "Rocky" from newcomer Sylvester Stallone (Morgan Spector) wins big at the Oscars, Chuck has one last chance at fame and glory - if his worst tendencies don't win the fight. I love a great boxing movie. Something about pugilists and their struggles to reach the top of the game inside and outside of the ring just makes for terrific human-focused drama. You feel for them when they're hit in the ring and then gut-punched in their real lives. The fact that a number of these stories are based on real people makes the drama all the more poignant. 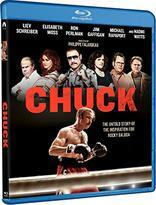 Where Chuck is at its best is when the film details Wepner's life outside of the ring. His tendencies to flatter fans and openly flirt with women - in spite of his marriage - details the story of a man who doesn't know how to deal with fame and having the spotlight pointed directly at him. He may be a skilled fighter. He may be able to take a punch and leave a pint or two of blood on the mat, but the man doesn't know how to hold himself back. It doesn't help when he's got enabling friends like his pal John (Jim Gaffigan) riding his coat tails. Through it all, Liev Schreiber delivers one of his best performances as the titular Bayonne Bleeder. His performance goes the distance as a simple twist of expression shows the man's inner turmoil. When he cheers on each Oscar win for Rocky at the Academy Awards, his pride is genuine because the film represents a piece of himself. The better piece that he wishes was the reality. As he falls in love with the fantasy of who he could be, especially when Stallone comes calling offering a part in the sequel, you can't help but feel sorry for Chuck as he gets in over his head and his worst tendencies for boozing, drugs, and women take over his life. Through it all, Schreiber keeps a larger than life character grounded and relatable. We all know people would be great if they could just control themselves. It's a great story to be sure, but unfortunately for this real-life biopic, it's one that has been told numerous times before. Removing the association with Rocky, Chuck suffers to stand on its own two feet because this typical rise, fall, and redemption arc have been told so many times before. There is an impenetrable wall of familiarity to the structure of the film. We know where it's going to end before it even begins. While necessary and adding a bit of a personal edge to the proceedings, the in-character narration by Schreiber keeps the film from emerging out of this shell. While Wepner is best known for fighting Ali and almost going the distance with the champ, I can't help but feel that the film should have started after the big Ali fight, don't even show the man in the ring. Introduce the audience to Wepner at his worst moment and then let them rise up with him rather than go around the traditional story cycle we've seen so many times before. But that's just me being a story nitpick. In truth, Chuck is a very good movie. In spite of my annoyance at the story structure familiarity, it proves to be a fascinating, well acted and directed look at a man who could have been the best of his profession and in his personal life, if he could only conquer his worst demons. It's an unflinching and unflattering look at a man who couldn't handle fame. It's also a great showcase of terrific performances from a fantastic cast as Schreiber clearly committed himself physically and emotionally to the part. Chuck may not be the best biopic or the best boxing drama to come down the pipeline, but it is still a good flick that doesn't disappoint. Chuck arrives on Blu-ray courtesy of Paramount. 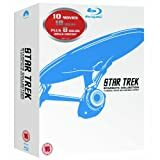 Pressed onto a Region A BD-50 disc, the disc is housed in an eco-friendly Blu-ray case. The disc loads directly to a static image main menu with traditional navigation options. I've got to tip my hat to cinematographer Nicolas Bolduc for the work he did on Chuck. As this 1.85:1 1080p transfer shows; a lot of work went into making the film look like a film made on the cheap during the heyday of 1970s movies. The noisy grain structure, heavy primary saturation - all of it looks like it was lifted from a film shot on 16mm over forty years ago. I wasn't able to locate any technical specs that stated whether or not this movie was actually shot digitally and employed a heavy grain filter for aesthetic or if it was actually shot on old Super 16 film stock. Regardless, the effect is terrific and gives the film a rough around the edges feel that lends itself to the story. Colors are vibrant and primary rich. Blues and reds get plenty of attention - especially the ample amount of blood Wepner sheds in the ring. Black levels are deep and inky with a wonderful amount of three-dimensional depth. Some slight banding crops up from time to time with a bit of ringing anytime heavily patterned clothing appears, but that's the worst of it. Without any serious issues of note, Chuck makes for a fantastic Blu-ray transfer. Chuck arrives with a decent but underwhelming DTS-HD MA 5.1 mix. Dialogue is clean and clear throughout and sound effects enjoy plenty of resonance - especially heavy punches during the fight sequences. The terrific period music, as well as the score by Corey Allen Jackson, enjoy a strong, well-defined presence. Everything is all well and good for the most part with this mix. There's plenty of space around the elements to give various scenes plenty of space and dimension. That said, this is a very front/center heavy mix. If it'd been a stereo only mix, it'd been just fine and not lost a beat. The surround activity is very selective, usually letting the music and score fill in the empty channels. Even the big crowd sequences when Chuck fights or goes out to clubs maintains a front and center vibe to it with little to no side and rear activity to speak of. Which is fine, as the film's audio is interspersed with frequent narration that dominates the mix, this is fine. But those looking for that all encompassing immersive experience may be left out in the cold. As this film failed to secure a wide theatrical release, it's understandable that the bonus feature provided this disc release is but an afterthought. At just a couple minutes, there's not a lot of insight beyond Liev Schreiber's commitment to the role. If you're interested in a strong character drama about a flawed human being, Chuck is a hell of a great flick. Removed from the fact that Wepner's life proved to be the inspiration for Rocky, his life's story is some pretty powerful material as the filmmakers wisely didn't pull their punches. However, I can't deny the sense of familiarity as the film follows the standard biopic story structure. It's still a great flick and well worth giving a look. Paramount has given Chuck a terrific video transfer, the audio mix is strong but underwhelming in the surround department. Bonus features are a non-starter. At the end of the day I'd encourage people to take a look at Chuck as it is a very well-crafted human drama, but as a blind buy purchase, maybe not without seeing the film first. Make sure you want to have it on your shelf. Worth a look.